The Coalición Latinos Unidos de Lake County (CLULC) is committed to assisting Latino/a students to access institutions of higher education and obtain a college degree. The North Chicago Rise Scholarship will go towards filling the gap between all other financial aid resources and the cost of tuition for two North Chicago Community High School (NCCHS) students. 500-750-word essay, typed and double spaced. Tell us about yourself. 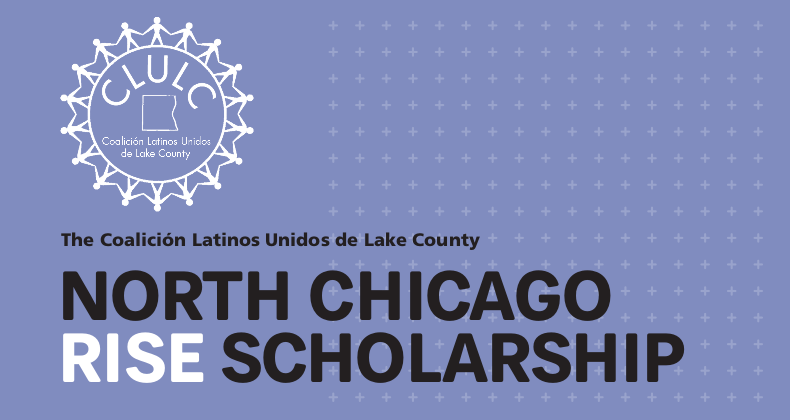 Describe your goals, how the scholarship will help you achieve them, and how you will use your education in service of the Latino community of Lake County. Application and supplemental materials (transcript and essay) must be received by the deadline, Friday, April 19, 2019. Finalists selected by CLULC will be interviewed on Friday, April 26, 2019. Finalists will be asked to bring a copy of their college acceptance letters and financial aid award/scholarship letters to the interview. A selection committee, comprised of CLULC Board members, will review the scholarship applications. We will utilize a holistic review process, giving careful consideration to all credentials presented by the applicant. Incomplete applications will not be considered, and the applicant will not be notified about missing documents. North Chicago Rise Scholarships are “last-dollar” scholarships, meaning that students must first exhaust other sources of financial aid, including government-subsidized loans. Scholarships shall only be paid directly to the bursar/financial aid office of the student’s institution. Scholarships may be renewed, in the sole discretion of the CLULC for up to four semesters (or two years) for an Associate degree or eight semesters (or four years) for a Bachelor’s degree. Scholarships will only be available for students who are enrolled full-time; who are in satisfactory academic standing at their college; and who complete FERPA releases to share grades and other college information. If eligible, scholarship recipients must complete the Free Application for Federal Student Aid (FAFSA) by October 31 of each year. All scholarship recipients are expected to attend the CLULC’s Noche De Gala Scholarship Award Dinner. Winners are required to submit a photograph and short biography to be posted on CLULC’s website. Our Mission is to serve with harmony, strength and unity to improve the quality of life in the Latino community through education, professional networking and accessibility of services.